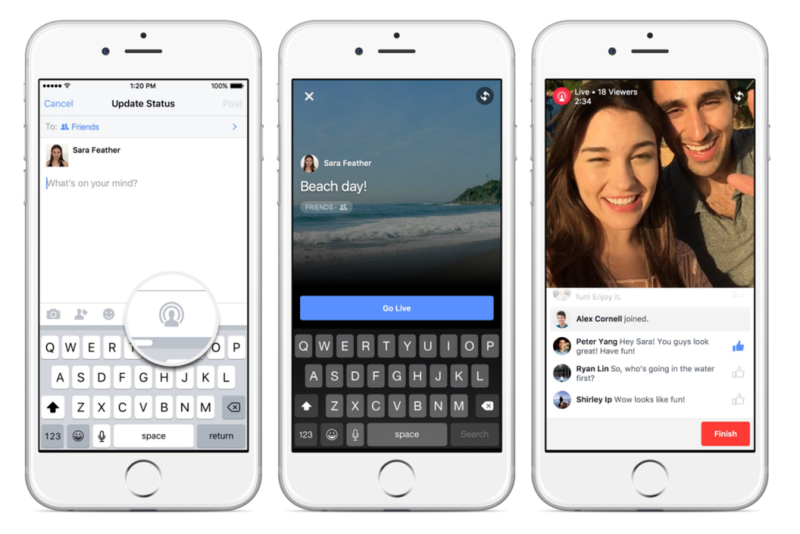 Facebook launched Live Video feature especially for celebrities and other certified users last year. This feature enabled those celebrities to load their videos for their admirers. Now the Facebook is ready to introduce this video feature for more users. This would ultimately allow those users to have better relations through video sharing with their loved ones. Facebook is about to introduce this feature to the Facebook users in US with the help of iOS app, which will be available around the globe shortly. For the time being only iPhone Facebook users across US will be benefited initially. This feature is easy to understand and use. Inorder to broadcast a video or an event, you don’t have to install any other application or package. All you have to do is to tap on Live Video icon which you can see on the Status Update. Facebook also allows you to give a short account about the video and what is portrayed on the video. Facebook also allows you to pick the users whom you want to see the video from your friends list. When the broadcast progress, Facebook will let you know the number of friends watching the video and spectators are allowed to comment on the same realtime, which is almost similar to YouTube streams. Facebook also allow the user to save the video to their timeline, when its broadcasting is completed. Then it gives an opportunity to the publishers to either save the video or delete it. On contrary to other live streaming services, Facebook allows you to get the live stream of your favorites on the news feed on real time basis. Facebook also allows you to get subscribed to your favorite’s live broadcast and when they go for broadcast for the next time, Facebook will notify you. Facebook Live Video Feature will pose a severe threat to Periscope, which has a customer base of only about 300 million.Facebook is already having a customer base of 1.59 billion which is expected to increase with its new feature. In Periscope the video can be kept for upto 24 hours only. But in Facebook this can be kept live for as long as you want. But Periscope guarantees certain other features like vertical or horizontal recording with the support of action cameras similar to GoPro. Facebook is expected to launch the same soon. This move of Facebook also irritates YouTube also. To sum up live video streaming providers will have to strive hard to overcome this severe threat from Facebook, as they have already gained a huge customer base. Facebook for the initial stage, this will be available only for iPhone users in US. Later this facility is expected to launch for Android handsets also. For the time being, Facebook is planning to launch this iOS app in various countries like UK, Japan, Australia, Sweden, New Zealand, Denmark and Norway.